In the early centuries of its life the road was the northern part of Shacklewell Lane, which looped from Dalston to Stoke Newington Common. In 1864 the Great Eastern Railway Company gained permission to build a branch line running to the east. Builders quickly grabbed the oppor­tunity to replace market gardens with houses along this section of the lane, which was renamed Rectory Road. In those days the road connected with Stoke Newington Church Street, which led on to St Mary’s church and its rectory (both rebuilt in the 1850s). The railway line opened in 1872, as did Rectory Road station, which is actually on Evering Road. Soon after­wards the route to Church Street was diverted when devel­opment around Garnham Street blocked the way, forcing travellers onto Northwold Road. As housing filled the neigh­bourhood ever more densely, the street’s character slipped inevitably downmarket. Landowner the Tyssen estate was given permission to convert some of the larger houses to indus­trial use in 1933 after warning the council that the altern­ative was multi-occupation. Rectory Road station was rebuilt in the 1970s. Nowadays, the neigh­bourhood is dominated by council towers looking down on turn-of-the century terraces. For most of its length, Rectory Road is part of the Stoke Newington one-way system, deflecting City-bound A10 traffic away from the High Street. Three early-19th-century houses survive at the southern end of the road, and are grade II listed. 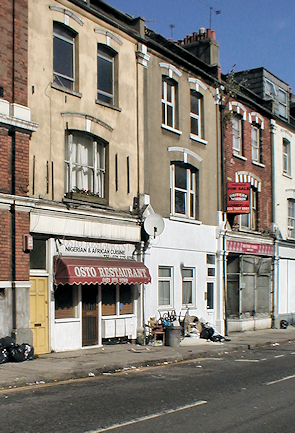 Rectory ward was abolished at the last boundary reorgan­isation and Rectory Road now divides the wards of Hackney Downs and Stoke Newington Central.